Here you will find Information about Custom Plastisol Transfers screen printing process, quantity, artwork requirements, application and other technical data. Including the various types of custom plastisol heat transfers the client can have us reproduce according to each production job. SpotPro graphic Heat Transfers are made via the traditional screen printing process using plastisol inks. They print on all fabric colors and work on cotton, polyester, linen and Lycra / Spandex blends with 20% stretch, like knit fabric t-shirts, rib knit fashion tops, fleece sweats, jackets, sports team uniforms, canvas bags and more. Easy and quick to Apply yourself on your own stuff with Home Iron or Heat Press. No sewing required. Custom Plastisol Iron-on Transfer List Prices are calculated based on the total colors in your artwok per transfer sheet, NOT per design. 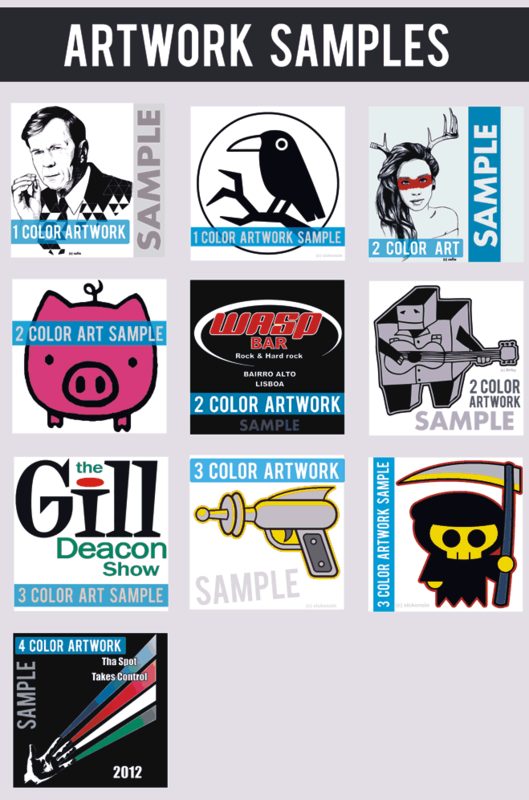 You can Gang Multiple Designs on a sheet with the same colors (View Artwork Samples). We also offer the Job Run Color Changes Option to reduce the cost when applicable. After Checkout clients can email or Submit & Upload their Graphic Designs for production. Artwork Must NOT infringe on copyrights or trademarks. Artwork must be clean, crisp (no jagged lines), finished and ready. Minimum art Resolution 300 dpi. Minimum FONT size converted to curves 48pt. Resolution at 300 dpi. Digital File formats, VECTOR files, CDR, AI, EPS. One color art, provide Artwork in Black. To show WHITE color use GREY Color. Without Backgrounds. Artwork must be provided in its EXACT SIZE. If you are a new client and need to see, feel, test our custom made plastisol heat transfers, we recommend you get the Plastisol Transfers Samples pack for $ 10.00. This will be deducted from your order. Head over to the Order Page and choose the transfer sheet size and select your design number of colors. Example: if the graphic artwork designs on the transfer sheet have 3 colors. Start by selecting the 3 color Custom Plastisol Transfers option. Q: Are there art charges? Art Charges apply when you hire Spot98 graphic artist staff to create or re-create your artwork or idea concept and to prepare artwork for production. Start at $ 60.00 per hour. $ 25.00/ea. Additional Production Proofs. $ 10.00/ea. Additional Graphic File Downloads. $ 20.00/ea. Additional Gang Layout. Q: Why are design total colors important? and the Burning/Making of each Screen for Every Color. Special Adhesives and Base Colors also require Screens. Spot98 charges a flat rate for every Screen. The larger the Screen as per our Sheet Sizes, the more expensive it gets. Screen Charges are a One Time Charge Only. No Screen Charges on Re-Orders of the same Graphic Artwork. Q: what is an Order Job Sheet? A Job Specifications Sheet (Spec-Sheet) is what we need to start pre-production for all Custom Transfer Jobs or for Providing Price Quotes. The information you provide in the Spec Sheet helps us learn about your project and the best way to accommodate your needs to ensure the best quality possible...and a happy ending. Please provide us with the following information together with your artwork designs. Transfer TYPE you need, Size, Art Colors, and Total Transfer Sheets Quantity ? How many Colors on the Transfer Sheets? What fabric types will you be printing? When do you need the Transfers Delivered? PANTONE color codes and each design EXACT Size? Q: I need 25 sheets Regular size, can I gang? Yes, with Design Ganging you can group designs within each job sheet using the same job colors. We do recommend clients leave about 1 inch (2.5cm) between designs. The 25 qty is possible but it will raise your cost per sheet very high. You are better off spending a little more and start with the 50 sheet quantity. It is also important to inform us the artwork color quantity, since our prices are based on the sheet size, colors per sheet and total sheet quantity. Have a look at our current Custom Plastisol Transfers Price List ( pop up / print version PDF File ). Q: I need more info, where do I start? New to the printing trade, need to learn more about Plastisol Heat Transfers?. New clients should really consider ordering Plastisol Transfer Samples first. You will be able to see, test, wash, and feel the difference. The samples pack cost $ 10.00, but it will be deducted from your Transfer Order, or Applied as a Store Credit. The samples pack contain 20 or more Transfer sheets of SpotPro Spot Color Transfers and SuperGlitz Glitter Transfers, plus Application Settings, Product info, and Price List. Q: How are they are made? The following will give you a general idea of how Custom Plastisol Transfers are made. There are various processes within the manufacturing of this type of heat transfer, but overall these transfers are made via the traditional Screen Printing Process. Using plastisol inks, with other elements, adhesives and such. After the Camera Ready Artwork is provide along with the Job Sheet ( aka specifications or line sheet ), our work begins with ganging all the artwork for the job on jumbo size sheets 50x70cm, and output the film for screen. Color sample the inks to match the artwork color codes and make the first artwork color screen. Setup the automatic printing press, test and adjust the run, and start running the job. 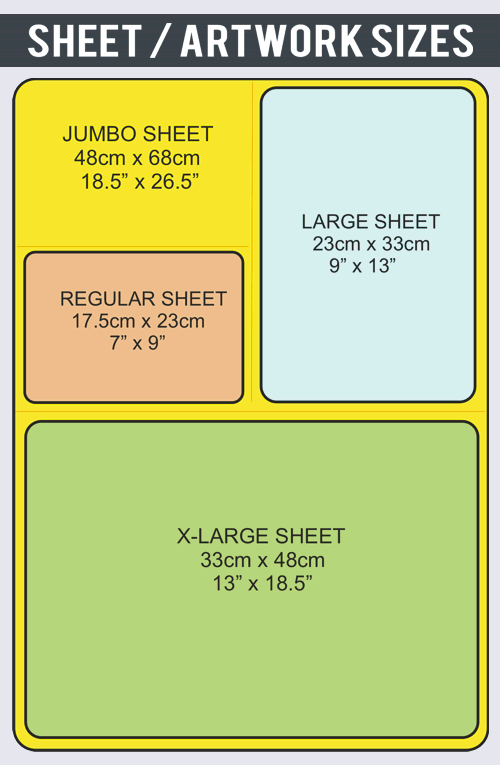 The finished Transfers sheets ( regular and large size ) are then cut off from the jumbo transfer sheet ( 50x70cm ), in 50 sheets quantities, quality tested and factory sealed for shipping. Q: What are the Transfer Sheet Sizes? Note: Transfer Prices are based on the Sheet / Art Size and on the artwork colors per sheet. Transfer Prices ARE NOT based on how many designs can FIT inside the transfer sheet aka as Gang Sheet. Q: What is a Gang Sheet ? In the Custom Printing Trade, Design Ganging or Gang Sheet means grouping various designs within a certain Sheet Size. Often these Gang Designs are cut OFF the Gang Sheet to be printed individually on shirts etc. For this reason it is important to leave squared-off space between designs in the Gang Sheet Layout in order to make it easy to cut them off the Gang Sheet and to apply. Q: Do they need to be cut around the design? do they wash off? There is NO CUTTING AROUND THE DESIGN OR EDGES of your image design, ONLY the design prints on the shirt. These are extremely durable heat transfers after they are printed on shirts or other textiles, machine washable and DO NOT crack when stretched up to 120%. They are made with special adhesives to endure a strong bond to the fabrics. They will most often outlast the garment. They are quality tested on a regular basis. Q: Are Plastisol transfers the best to apply with a heat press? These plastisol transfers can be applied with a heat press or home iron. The heat press is required with plastisol transfers and other transfer types when printing Large Size Graphic Designs, or when printing large quantities of t-shirts for example. The SpotPro Plastisol Transfers application on various types of knit fabrics, like, jersey, rib, or fleece and so on, and using a manual heat press machine to print them, it takes 3-6 seconds to print a t-shirt. This is a great benefit when printing bulk high quantities. So yes, for large runs, Plastisol Transfers are the best to apply with a Heat Press Machine. However, they also work great with any Home Hand Iron with a cotton setting. It is a slower printing time, 10-30 seconds. The best part is if using a Heat Press or Home Iron, they work every time, no loss, no damages. Q: How many times can each be use? Can they be stored? They can only be used one time. Actually a good and perfect application is when all of the ink come off the transfer paper after they have been applied. Plastisol Transfers have a long shelf life in normal environmental conditions and can be used up as needed for a long time. Do not expose them to high temperatures and direct sunlight or extreme cold for a long period of time. Q: Can you do white color designs on dark shirt colors? Yes, to print on all colors is one one the best features of our Spotpro Transfers. To print white designs on black shirts for example is not a problem. The plastisol inks used are high quality. Also, to make bright design colors like vibrant yellow look great when printed on a black shirt, a white ink pass is done behind the yellow to achieve a magnificent finish product. Q: We are based in Canada. Do you ship here, and time cost? We ship Custom Plastisol transfers worldwide to all friendly nations. On average, a package under 2 kilos Via priority mail with tracking number, is delivered 5-10 days to most countries after it come out of production and shipped out from our facility. It is important to account the transit time, holidays and other issues that may arise to ensure on time delivery to complete the project. Fast 1-2 day shipping via Fedex and other overnight service may end up costing more than the transfers made. Q: What is the minimum sheet quantity per custom order? Our minimum for custom plastisol job order starts at 6 sheets, job order. Of course to setup for this low quantity job you will need to pay for the the setup and film plus screens per color, and this elevates the cost per transfer sheet. Starting at 50 sheets makes the overall cost per transfer very good. We recommend a 50 sheet quantity per custom job.. Custom job means 50 sheets of the exact same artwork on the sheet. As for shipping the order as one unit, yes we do that. Of course if the entire transfer size is 50cm x 75cm for example, it is best to ship it cut down to save shipping costs and the risk of transit damage. Our Standard 18x25cm is a good size for application and transport. Please keep in mind with custom work all jobs are different, and to ensure a happy ending it helps to start and follow thru to finish. Have a set finish date, plan ahead and let us know when you are ready.